Theresa May's Brexit shambles has now become so bad she can't even put her deal to a vote - never mind win one. It was apt that around the world at the weekend, as Mrs May desperately attempted to stitch her dead deal back together, St Patrick's Day was celebrated. There are those who write off the annual exodus of Irish ministers, as they go abroad to join parades, as mere junketeering. But the extent of the celebrations, in every corner of the world, shows how far Irish influence has seeped. All that handshaking and plámásing clearly works. For a small country, Ireland has friends in high places - and they don't like to see us get kicked around. Most recently, this support was manifest in the statements of US congressmen who vowed to derail any trade deal between the UK and US if it came at the cost of a hard Border. If the prime minister wants to do a deal with the United States, it will not come at the price of peace and security on this island. Mrs May just can't escape the Irish. There is a reminder everywhere she turns. So it must have been galling to see London festooned in tricolours and shamrocks over the weekend - a visceral reminder that it is the Irish issue that has foiled her. Mrs May, and her cabinet, refused to treat the problem of the Irish Border with the level of attention it deserved, assuming the Paddies would just eventually get into line, and now she is reaping the reward for that error. Ireland, and the EU, stood firm against the ignorance being spewed by those who insisted unnamed technological solutions could answer the question of the Border. Irish diplomats have brilliantly communicated the necessity of the backstop to other EU leaders, meaning there has been no deviation from the joint EU position. Meanwhile, Foreign Affairs Minister Simon Coveney and Europe Minister Helen McEntee have taken part in numerous media interviews in the UK in order to advance the Irish argument, enduring much ignorant commentary in the process. Mrs May, for her part, declined to explain the requirement of the backstop to her own party members and now, as a result, can't get her deal over the line. Her lack of foresight, in failing to realise she would not only have to get a deal but then sell it to the House of Commons afterwards, is extraordinary. There had been a danger that Brexit would reduce Ireland to roadkill, as the UK bulldozed its way out of the EU. That danger has now receded. Ireland, instead, has been bolstered by this process - as other countries have come to our defence and never wavered in their support. For the UK, its dreams of Brexit glory have been an unmitigated disaster. In fact, the prospect of Brexit occurring, a little over a week from its March 29 deadline, looks as remote as ever. The British infamously voted for Brexit to take back control, but they are now in dire need of a designated driver. In more than two years, Mrs May and her government have failed not only to deliver Brexit, but even to define it. There is still not an agreed consensus on what Brexit means and no attempt, thus far, to find one. Mrs May thought she could beat the House of Commons into submission by holding repeated votes on her deal until it eventually passed. But, thanks to Speaker John Bercow, that plan is now as dead as her deal. Mr Bercow caused a sensation on Monday when he ruled out the possibility of endless votes in parliament on the same deal, thereby scuttling Mrs May's masterplan. Yesterday, at her cabinet meeting, the prime minister refused to even express an opinion on whether she would advocate a long extension or crash-out next week - because her position is too weak to advance either cause. Remarkably, Mrs May has managed to irritate and alienate almost everyone. 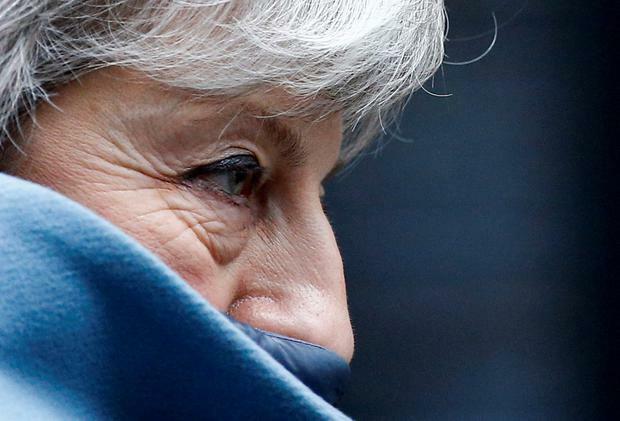 Neither Brexiteers nor Remainers in her government are happy with her, but no one else wants the poisoned chalice of leadership. So she limps on, with no real power or authority. EU negotiators have said the UK has to outline a credible way out of this morass before an extension beyond March 29 can be granted. But, given the ongoing political crisis, that is expecting too much. No one in the UK, clearly, has the first clue about what they are doing, what they want or how to get it. They preferred to resort to empty sloganeering, like Brexit means Brexit, rather than engage in fine detail, and are now hopelessly deadlocked as a result. The nosedive into which British democracy has sunk may yet be terminal. The government has no plan and has now lost all control, but the opposition is similarly stymied. There are no answers to the Brexit mess among the Labour benches. Meanwhile, this once great nation has been reduced to a laughing stock on the world stage as it becomes increasingly clear they couldn't negotiate their way out of a paper bag. Even the French are now openly mocking Britain's very public meltdown, with their Europe Minister, Nathalie Loiseau, announcing she had named her annoying cat Brexit. "He wakes me up every morning, meowing to death because he wants to go out. Then when I open the door he stays put, undecided, and glares at me when I put him out," she explained. Meanwhile, German Chancellor Angela Merkel could only sigh and witheringly say yesterday that she "wasn't aware of the rules of procedure of the British parliament from the 17th century" - which have been employed by Mr Bercow to prevent Mrs May having yet another meaningful vote. EU negotiators may want a signal of intent from the British before they extend the negotiating period, but the harsh reality is that time is rapidly running out and no one can agree a way forward. Any lengthy extension will require the UK to hold EU elections in May and the deadline for having those candidates in place is April 11 - a few short weeks away. There will be recrimination over the coming week as exasperated EU negotiators berate the British for failing to have any credible plan B, but they will ultimately grant an extension. When the alternative is the carnage of a no-deal exit, which would damage the economies of a large number of European countries, including our own, then some stalemate will be cooked up at the last minute. But decision time is fast approaching. The UK either wants in or it wants out. More importantly, it needs to elect a government that has a mandate to deliver a plan and the votes to see it passed. If Theresa May wants to do one last act of service for her country, she should resign and use the resulting election as an excuse to extend the Article 50 deadline. Otherwise, there will just be continued chaos.